19 Responses to "Ye sitaare hain motiye ke phool"
* – The “dil ki duniya lutaaye” part is a guess on my part. Perhaps someone can listen to that line and verify. Thanks for your informed comment. It is a step towards confirming that the above nazm is indeed written by Tanvir Naqvi. One song from Wamiq Azra (1946) is posted in the blog, but it is not the one that you so fondly remember and quote. Thank you for the song link, Kamath Sir. It is very melodious, a memorable treasure. ‘nahm’ ji, nice feel good post about my most favorite singer of hfm. From what I read from those who knew Rafi saab, even if he was told that he would be worshiped by posterity, he would have continued to be the humble human he was. 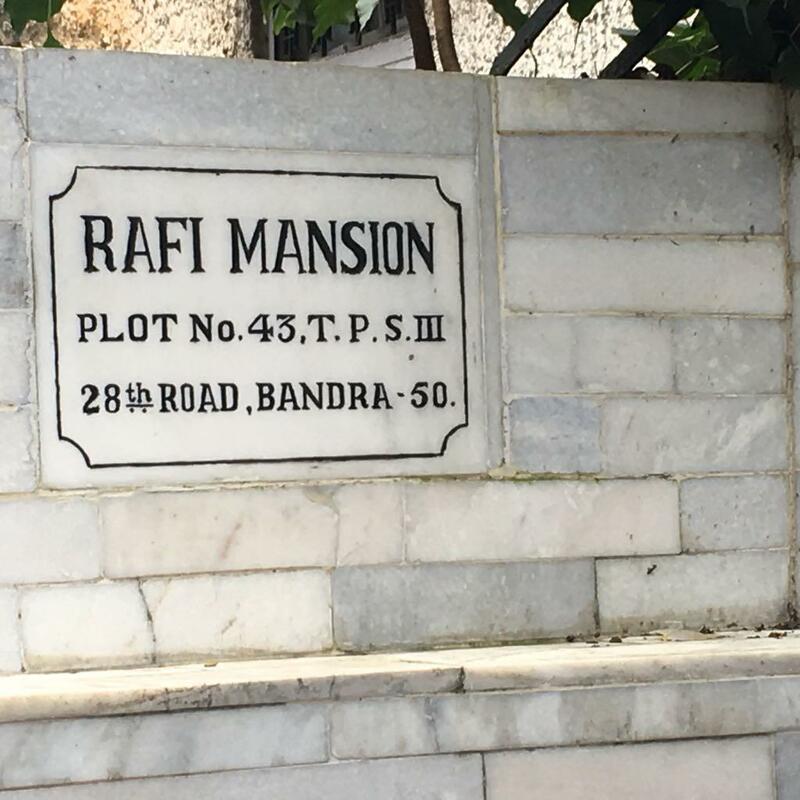 I did not know he lived in Bandra. I had an impression that he lived in Byculla. I have added the photos from your post to my collection.! Thanks for posting the pics. He was aptly referred to as ” Mausiqui ka Paigambar’ by Naushad Saab. Thanks for liking the post and photos. how long ago was this Bandra- Trip of yours’. i was in that exact same place on july 4th. i saw that most of Bandra’s roads are taken over by legends. there is Nargis Dutt road which runs off hill road. 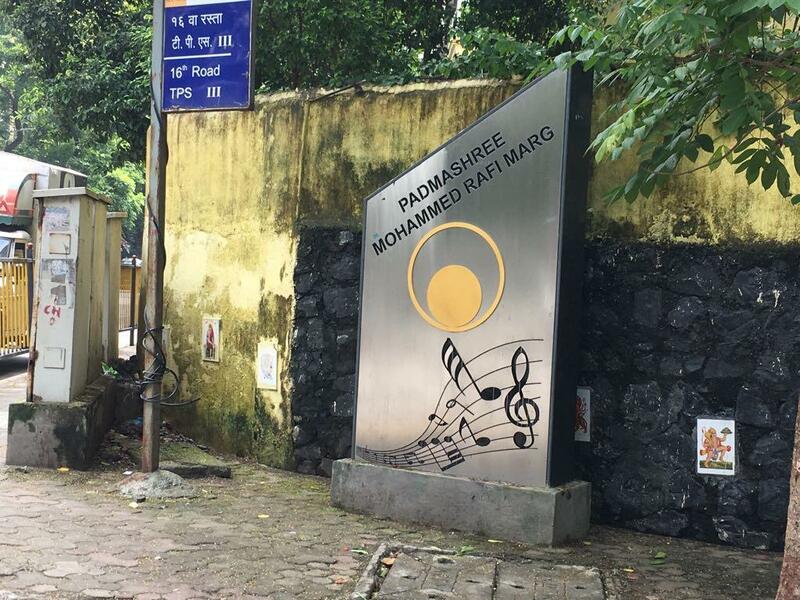 then there is Padmashree Mohammad Rafi Marg, there is Padmashree Rajendra Kumar chowk from where hill road starts its upward journey. a walk on hill road and i saw that Dilip Kumar’s bungalow, and Rishi Kapoor’s bungalow “Krishnaraj” are both under redevelopment. Rakesh Omprakash Mehra’s “Mamta” and Gulzar’s “Boskyana” are still there. 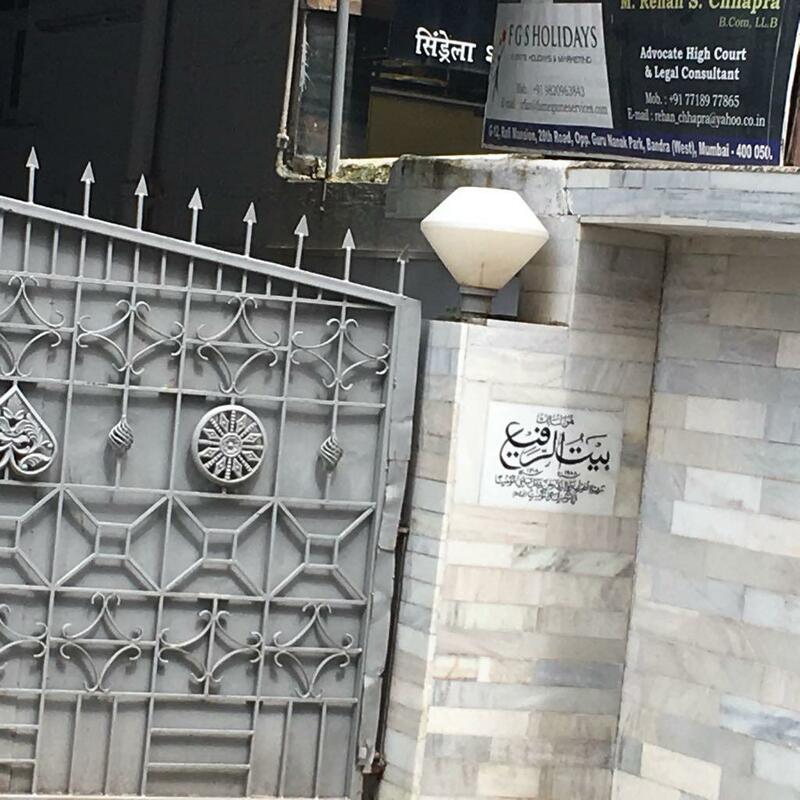 and Nasir Husain’s (that is the spelling on the name plate) has been slightly modified the courtyard at the back has given way to a multi-storeyed house, not skyscraper. This trip was just this saturday, i.e. on 28th July. It was entirely co-incidental that we reached the spot that day. Not seen the other places that you mentioned recently. The earlier trip I mentioned was in the last century. I mean it when I say that western suburbs especially if involves crossing S. V. Road is a big NO…..NO from my side. In early 90’s I was working in offices situated at Santacruz, Vile Parle and JVPD. JVPD office was just a stone’s throw away from 10th Road & Amitabh Bachchan Bunglow. Just beyond in the next lane were J. Omprakash’s Bunglow and Danny Danzongpa’s Bunglow with Pagoda style roofs. These were the things I had seen and remembered, as told by the colleagues. I had Amitabh Bacchhan autograph too on a piece of paper, brought for me by the office boy, who had gone to see the shooting of Amitabh & Neelam for the film “Insaniyat” at Juhu Garden (the one with the aeroplane). Since leaving those early years jobs and joining my present one, I can count the rare trips to that side of the city on my finger tips. Visit to my Uncle’s flat at Oshiwara, than a wedding at Andheri (West), a few shopping trips to Santacruz (W), visited Turner Road 2-3 months back too. One of those trips is also the Vile Parle meet of this blog’s group. Thanks for posting very melodious 2 part song of Rafi Saab, heard first time. Please correct me, if to my knowledge, such tunes are called ‘merciyaa’. I used to stay in Atomic Energy Quarters on 15th road and I had visited Rafi Saab at the Rafi Mansion, along with my Wife. Even though, he was not well he received us with warmth and treated us with ‘Rooh-e-Afza’ and some snacks. I had a dairy where my wife had written down fifty Rafi Saab songs of MY liking. While in USA, I had given it to my friend, who was an ardent fan of Rafi Saab. Unfortunately my friend died suddenly and later his son could not locate that prized Dairy to return it to me. Thanks for your article and Photographs that reminded me of that wonderful memories. Thanks a lot, Nahm M’am, for a very valuable post. A very rare song unreported in Geet Kosh and an apt choice to remember the great singer on the very date on which he went silent (khamosh ho baithe) 38 years back. As a bonus, one also got evoked responses from respected Shalin Bhatt sir and Kamath sir, which further enhanced the enjoyment. Bhatt sir’s accurate guess was confirmed by video posted by Kamath sir. By the way, I too heard the word “salaab” as posted by you. As for the missing one, I suggest “dahakte or sulagte” as these words appear to be best associated with the context of ‘sholay’. be ‘salaat’, but I have my doubts about this. Here the missing word could be ‘Phool’ , but it is there in the next line. It could be ‘gul’ or ‘kaliyaan’ or ‘oas’ or ‘shabnam’. Something diverse from the concept of ‘aag’, I think. Thanks Ma’am for your efforts and article covering this melodious song. Tributes to legend Rafi Saab. Also thanks to the Javed Raja Bhai to make this rarest gem available on YT. About (?) word in the first part it must be INQUILAAB. You are absolutely right about “Inquilaab” . Another word for “warq” is “Safha”. Plz dont mind Ma’am. I have provided the meaning of these words just for reference that how inquilaab word suited here and the phrase got its meaning. My intention is not to teach you coz I know you are a genius of Urdu. What a wonderful post this is, nahmji. Especially since it contains your personal experience of visiting Rafi Mansion, albeit from outside. Seeing these pics makes me feel like Rafisaab is still there in the building.